Last issue, we talked about decreases. What could be more natural than to tackle increases today? Most people have a favorite increase that they come back to again and again. Unless the pattern specifies a particular increase you should feel free to use whatever you like best. But you may find it helpful to have a passing acquaintance with some of the other increases that may give a different effect. The simplest increase is the yarn-over increase which is simply worked by moving the yarn under the right hand needle then over it towards the back of the work. The yarn over increase is intentionally obvious – it makes a big hole in the knitting which is the basis of most lace knitting. 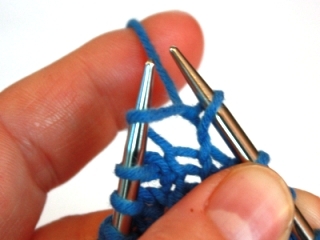 One way to make a M1 is to pick up the horizontal strand between two stitches and twist it. Another way to make a M1 is the Elizabeth Zimmermann method. It produces the same stitch, only in the current row rather than the row below. These increases do not – of course – have to be paired, you can use them individually if you like, or the pattern does not call for paired increases. Yet another way to increase is the knit through the front and the back (kfb) increase – also known as a “bar increase”. 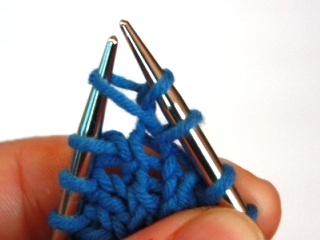 This increase is very sturdy and does not leave any visible hole, but does make a purl bump on the knit side of the work [what some people call the "bar"]. One of the most invisible increases is the raised or lifted increase. If you find that either of these leaves more of a hole than you’d like, feel free to knit them through the back loop to tighten them up. Theresa is an American who has lived, worked and knitted in Norway for a little over a decade. She has recently become quite addicted to micro-blogging. 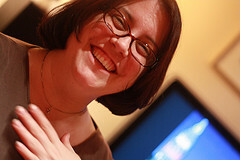 © 2009 Theresa Vinson Stenersen. Contact Theresa.